Ever wonder whether the U.S. Food and Drug Administration approves cosmetics? Or how a new prescription drug is approved? How often the FDA inspects food manufacturing facilities? Or how the FDA assesses the safety of vaccines? Now, you can find answers to all these questions and more at a new web resource launched by the FDA.%%DynaPub-Enhancement class="enhancement contentType-HTML Content fragmentId-1 payloadId-61603 alignment-right size-small"%% On Monday, the FDA unveiled the first phase of its Transparency Initiative, which aims to help consumers gain better understanding of the regulatory agency. It's designed to explain the agency's operations, how it makes decisions, and the drug approval process, among other things. 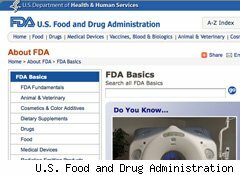 Through the new FDA Basics page on its site, the public can get an overview of what the agency does, said the chairman of the FDA's Transparency Task Force, Dr. Joshua Sharfstein. The site's resources include questions and answers, short videos, and conversations with agency personnel. In the future, the agency intends to add online sessions in which senior officials will answer questions on various topics. The Transparency Initiative was launched in response to the Obama administration's commitment to "an unprecedented level of openness in government," the statement noted. But beyond Obama's goal to increase transparency, the move is a response to long-standing critiques regarding the FDA's operating style. Just recently, the Government Accountability Office noted concerns about the FDA's oversight of post-market drug safety. It's not surprising, then, that one of the first moves by FDA Commissioner Dr. Margaret A. Hamburg -- appointed in May of last year -- was to increase transparency at the agency. As Dr. Sharfstein noted earlier, "The FDA website currently contains significant amounts of information, but the content may be best understood by those who are familiar with the agency." To begin to address that problem, in recent months, the task force solicited public input on improving agency transparency. The result was the creation of the FDA Basics page. "This initiative will make information about the FDA more user-friendly and accessible to the public," said Dr. Hamburg. Whether that's accurate, though, remains to be seen. One of the first questions on the FDA Basics site is: "Can I tell if FDA has approved a product by looking at the label?" The answer starts with a simple 'No,' accompanied by phone numbers, email addresses and a url for where the public can find the information. But, inevitably, things get complicated. For example, vaccines, medical devices and animal products are separate categories, and the information about them is on other pages on the site. The information is all there, but it would be difficult to simplify. Two more phases in the transparency initiative are upcoming. In phase two, the task force intends to make recommendations regarding how to make information about agency activities more transparent while protecting confidential information. These recommendations will be released at the end of February. Only in the final phase, the task force intends to make recommendations regarding the FDA's regulated industries, including how to provide information on the status of an application under review by the agency. This phase is expected to be completed two months after the second phase. By the way, if you're curious about the answers to the questions posed at the beginning of this article: No, the FDA does not approve cosmetics, although it does approve color additives used in cosmetics; its process for new drug approvals consists of several stages; its frequency for inspecting food manufacturing facilities is based on several factors; and vaccines undergo extensive testing to determine their safety and effectiveness.